The wood version of the TW-1038 door uses a 3/8″ thick plywood center panel instead of the 1/4″ plywood center panel that is found on a TW-10 door. 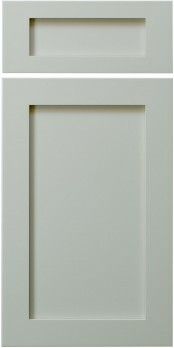 To perfect this door offering for a painted finishes, Conestoga (CWS) created the TW-1038 (MDF), which utilizes a full MDF construction instead of wood . This timeless look, along with the benefits of full MDF construction, make this door a perfect choice for cabinets with a painted finish.